Note from the Editor: This article is an excerpt from the presentation, Introduction To Strategy Development and Strategy Execution, which is available as a complimentary download. 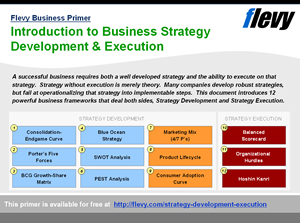 This is a 54-slide PowerPoint presentation introducing 12 business frameworks on Strategy Development and Strategy Execution. The full presentation is also available for preview below in this article. For each framework, within the presentation, there is an overview, explanation of proper usage, and delineation of analyses involved. The presentation also provides references to more detailed documentation, guides, and methodologies if you would like more information. A successful business requires both a well developed strategy and the ability to execute on that strategy. Strategy without execution is merely theory. Many companies develop robust strategies, but fail at operationalizing their strategies into implementable steps. In this article, we will provide overviews for 12 business frameworks related to various aspects of Strategy Development and Strategy Execution. At the bottom, we include references for further information on these business concepts. Below, we have provided summaries of the 12 strategy frameworks covered in the presentation. Please note the original PowerPoint is much more comprehensive. It includes additional content, data, and associated framework diagrams. The Consolidation-Endgame Curve framework (also known as Consolidation Curve or Endgame Curve) is not a well known framework, but is one that offers incredibly insights into market dynamics and competitive strategies. 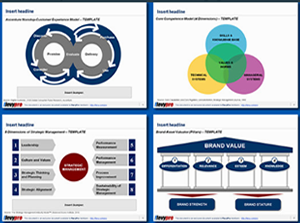 This framework was developed by the management consulting firm AT Kearney after they performed a study on 25,000 firms, representing 98% of the global market cap. The firm realizes that all industries go through the same 4-stage lifecycle—Opening, Scale, Focus, Balance & Alliance. Across all industries, the same characteristics are exhibited at each stage of the Curve. By appropriately identifying our stage and understanding the defining traits and behavior of our stage, we can better understand and predict market and competitive behavior and trends. Every major strategic and operational move should be evaluated with regard to the industry’s stage in the Consolidation Curve. On a more subtle note, the industry stage also governs what type of management and leadership works best for the company. In other words, the management team in the Scale phase may not possess the right skills to run the company at the Balance & Alliance stage. It is based on the theory that competition in any industry is dependent on 5 basic forces—Potential Entrants, Internal Rivalry, Suppliers, Buyers, and Substitutes (or Complements). The collective strength of these forces determines the ultimate profit potential and allocation in the industry. Using this framework, we can determine how attract it is to compete in any industry, as well as what the overarching strategy should be to compete successfully in the industry—success is determined by the ability to develop a sustainable competitive advantage. It can also be used to assess which industry trends may pose as opportunities or threats. Compares the position of various players in one industry. The two axes of the matrix are 1) market/industry growth and 2) relative market share (RMS). We then plot our products onto the matrix and quadrant associated with the product drives its strategy. Question mark – Low RMS, high market growth. The key premise to this framework is that products located in each of the quadrants will be in fundamentally different cash flow positions and should be managed differently. This framework is used to assess trends in the evolution of a company’s portfolio of business (when matrix is drawn for both the current year and past years). It can also be used to understand the competitive position of each business, possible cash requirements, and focus attention on key issues. Blue Ocean Strategy is growth strategy framework focused on the idea of creating an uncontested market space–i.e. a “blue ocean.” This framework is very innovative, as its principles challenge the conventional business strategy principles of fighting competitors head-on. The Blue Ocean Strategy framework evolved from a framework called Value Innovation developed by Gemini Consulting (now Capgemini Consulting) in the late 90s. At the heart of Blue Ocean Strategy, we have concept of Value Innovation. Value without innovation tends to focus on value creation on an incremental scale, i.e. something that improves value but is not sufficient to make us really stand out in the marketplace. Innovation without value tends to be technology-driven, market pioneering, or futuristic, often shooting beyond what buyers are ready to accept and pay for. Value Innovation occurs only if we align innovation with utility, price, and cost positions. The focus here is not time-to-market, bleeding-edge technology or best practices. It is the ambition to break one of the most commonly accepted dogmas of competition-based strategy: the value-cost trade-off. It is conventionally believed that companies can either create greater value to customers at a higher cost, or create reasonable value at a lower cost. Here, strategy is seen as making a choice between differentiation and cost. In contrast, to create blue oceans, we need to pursue differentiation and low cost simultaneously, by looking within and beyond our industry boundaries and redefining a market altogether. For more information, download the full presentation on Strategy Development and Execution in original PowerPoint format here. The SWOT Analysis (also called SWOT Matrix) is one of the earliest strategy frameworks. It was developed in the 1960s at Harvard Business School by Learned, Christensen, Andrews, and Guth. The name is an acronym for Strengths, Weaknesses, Opportunities, and Threats. This framework provides basic directions for structuring strategic analysis. The underlying theory is that assessment of competitive position should combine both an external and an internal analysis. The internal factors are Weaknesses and Strengths, whereas the external factors are Opportunities and Threats. We can conduct SWOT analyses for our own organization in addition to our competitors, so that we gain added insight into our company’s competitive position. The output of this analysis is often displayed in the form of a 2×2 matrix. SWOT Analysis is often conducted in conjunction with PEST Analysis (see below). PEST Analysis is a framework evaluating macro-environmental factors used in the environmental scanning component of strategic management. The PEST analysis framework has become increasingly popular and relevant as the first decade of the 21st century have given rise to green business and environmental concerns from the public. PEST is an acronym for Political, Economic, Social, and Technological, which are the macro-environmental factors to analysis in this analysis. 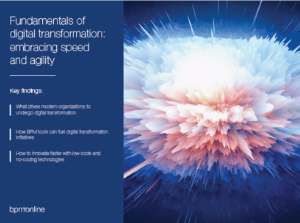 This analysis is often performed in conjunction with other popular frameworks, as a means of enhancing the understanding and output of these other frameworks. Specifically, it is often used to help explain the analysis in the following frameworks: Porter’s Five Forces; SWOT Analysis; Value Chain Analysis; and Industry financials. PEST Analysis is often performed in a 3-phase process: data collection, industry trend analysis, and trend quantification. The 4 P’s of marketing, often just called Marketing Mix, is perhaps the commonly used corporate marketing framework. The marketing mix refers to the 4 levers to adjust when determining the essence of product’s marketing strategy. The 4 P’s refer to Price, Product, Promotion, and Placement. This framework has been extended to 7 P’s, to also include Physical Evidence, People, and Process. The definitions for the additional 3 P’s should not be confused with the People-Process-Technology framework, which is more operationally-focused (vs. consumer-focused). Product Lifecycle analysis is a tool to predict how sales will develop based on the age of the product category. Marketers and strategists can use this analysis to predict sales growth, associated customer and competitor behaviors, and, in turn, devise the appropriate product marketing strategy. The Product Lifecycle itself it divided into 4 stages of development: Introduction, Growth, Maturity (and Saturation), and Decline (and Termination). The length of each period varies tremendously. Some products have very short cycles, whereas others can take decades or even centuries to go through the cycle. The lifecycle can be mapped against the Consumer Adoption Curve, where the peak of the curve generally occurs in the maturity stage of the Product Lifecycle. In fact, the Product Lifecycle is typically mapped against the Consumer Adoption Curve to draw out key marketing and competitive insights. By understanding what stage of the Consumer Adoption Curve we’re at, we can gain invaluable insights into the who our target customer are, as well as their defining attributes. The Consumer Adoption Curve is defined by 5 sequential stages: Innovators, Early Adopters, Early Majority, Late Majority, and Laggards. Typically, there is a “chasm” between the Early Adopters and Early Majority. Product Lifecycle Analysis also provides a framework to understand the competitive environment. It makes an underlying assumption that sales and profitability follow a predictable pattern for all industries and all products within those industries. The Balanced Scorecard (BSC) is a Strategy Performance Management tool. It is a semi-standard structured report, supported by proven design methods and automation tools, that can be used by managers to keep track of the execution of activities by the staff within their control and to monitor the consequences arising from these actions. It was developed by Robert Kaplan and David Norton. This approach enables companies to track financial results, while simultaneously monitoring progress in building the capabilities and acquiring the intangible assets they need for future growth. BSC also provides a framework for company’s to translate their strategy into measurable and actionable KPIs and objectives. Specifically, it ties 4 key management processes (Translating the Vision, Communicating and Linking, Business Planning, and Feedback and Learning) into both short-term and long-term strategic objectives. In Blue Ocean Strategy, the authors identify 4 main Organizational Hurdles that the organization must overcome for successful business execution. These hurdles arise when a company develops a new strategy to departs from the status quo. These hurdles are the Cognitive Hurdle, Resource Hurdle, Motivational Hurdle, and Political Hurdle. Although all companies face different degrees of these hurdles, many may only face a subset of the 4 hurdles. To overcome these hurdles effectively, organizations must abandon perceived wisdom on effecting organizational change. Hoshin Kanri (also known as Policy Deployment, Hoshin Planning, or just Hoshin) is a Strategic Planning/Strategic Management Methodology. It is based on a concept popularized in Japan in the late 1950s by Yoji Akao. “Each person is the expert in his or her own job, and Japanese TQC (Total Quality Control) is designed to use the collective thinking power of all employees to make their organization the best in its field,” Yoji Akao. This is the fundamental principle of Hoshin Kanri. In other words, this framework ensures that the strategic goals of our company drive progress and action at every level within the organization. This eliminates the waste that comes from inconsistent direction and poor communication. Hold participants accountable for achieving their part of the plan. 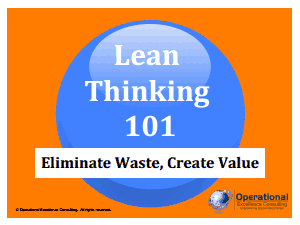 Hoshin Kanri falls under the umbrella of Lean Thinking (or called Lean Management, Lean Methodologies). Lean frameworks strive for continuous improvement of the organization. David Tang is an entrepreneur and management consultant. His current focus is Flevy, the marketplace for premium business documents (e.g. business frameworks, presentation templates, financial models). Prior to Flevy, David worked as a management consultant for 8 years. His consulting experience spans corporate strategy, marketing, operations, change management, and IT; both domestic and international (EMEA + APAC). Industries served include Media & Entertainment, Telecommunications, Consumer Products/Retail, High-Tech, Life Sciences, and Business Services. You can connect with David here on LinkedIn.